The high sun, the yellow tinge of the stone, the steep descent of the vico, the washing at the windows and the sea of the Bay beyond. 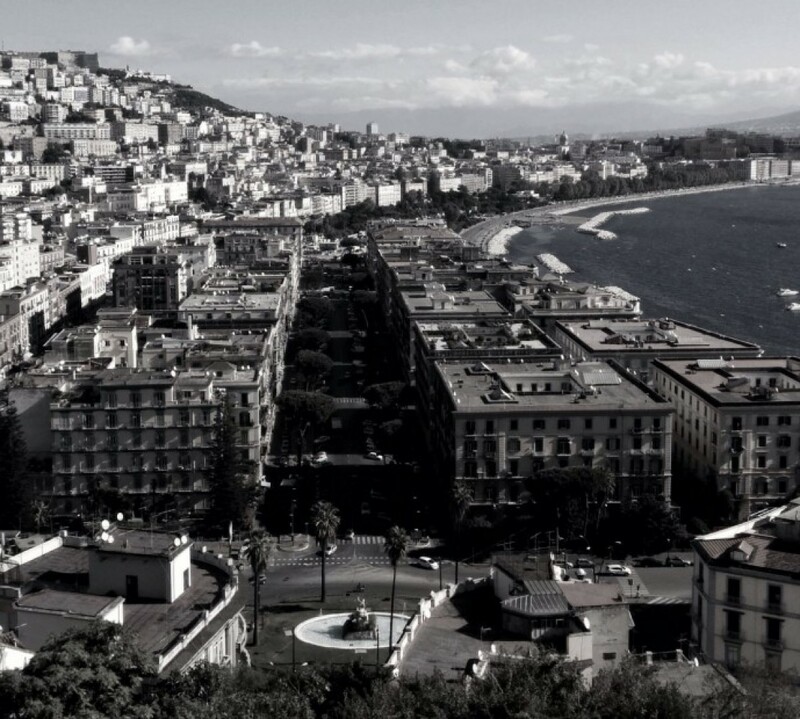 You couldn’t be anywhere but Vomero, Naples, as seen today by my friend Christian. OK, Capodimonte won this accolade back in 2015. But I would still encourage you to take a short walk by 4K video through this huge, rambling, atmospheric, overgrown ex-Royal park on a high hill above Naples. It’s a perfect place to jog, picnic, play with your kids, take a weekend stroll, have a furtive assignation, or walk off a large lunch. Or better still to find a quiet place for inner reflection, away from the hectic city below. London-based photographer Sam Gregg, who is particularly interested in ‘marginalised and dispossessed communities‘, has recently published a series of unromantic, unflinchingly honest, and insightful pictures of life in the city titled See Naples and Die. ‘A documentation of the spirit and vibrancy of the people who live in these areas, even in the face of abject adversity. They are fiercely proud of their heritage and emblematic of what it means to be a true Neapolitan’. A short interview with Sam by the creative website ‘It’s Nice That’ is here. More about the locals trying to change the public face of Rione Sanità here. A great post below by e-Tinkerbell on Oscar Wilde’s brief, post-imprisonment sojourn with his lover and downfall Bosie Douglas in Naples, at the time noted as ‘a delightful winter residence for those fond of pleasure and gaiety‘. Shunned, deserted, alone, he finally left Naples, a city he perceptively described as both ‘evil and luxurious’ and unable to publish his work or find translators, for Paris where he would die, a penniless social outcast, two years later at the age of 46. Naples is struggling to cope with its heaviest snowfall for over 60 years, bemusing the locals, shutting the airport, closing schools and offices, and causing traffic chaos. For a comparison of the conditions, below is the same scene in snowy Piazza del Plebiscito, separated by 62 years. The first famous image by Vittorio Pandolfi on the left is from 1956; the second on the right is by Fabio Cozzolino from 2018 who reproduces the original photograph, down to the car in the foreground. And the umbrellas in the background. More modern pictures of Naples (and Rome) in the snow here.